Ooh if it's anything like the above, it will certainly be worth the wait. Oh loving that quilt! Good luck with everything. I've been looking at this quilt elsewhere...quite like the pink too!! It will be worth making sure all those wrinkles are ironed out Kellie. You must be getting so excited now!! Can't wait to see all your lovely goodies. 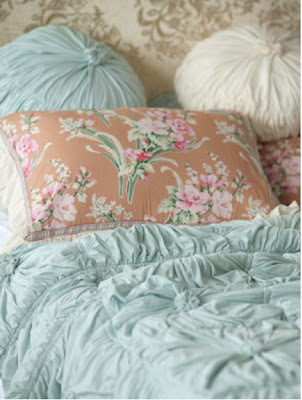 the color of that bedding is the perfect shade of blue/green! I love that duvet cover Kellie! I first saw it in the My Home store in Bowral...wanted to take it home then & there! i absolute love the colors! Oh gorgeous it is.So lovely.The colors are just beautiful! It looks so soft and luxurious!! ohhh soo pretty! i can't wait to see your shop, i know it will be so lovey! oh how lovely. can't wait to see your store! Oh, that's good news! I am excited for you. That bedding is beautiful and just what I am looking for. We are redoing our master bedroom and I am looking for a duvet set. Can't wait! I am anxious for a few of your scrumptious pillows, too! I love, love that quilt. Thats my all time fave colour (other than white-if you can call that a colour) for the bedroom! I have just been blogging saying I wanted a cover like this in duck egg but I am in the Uk, any ideas?